The town of Elx - also known as the palm grove of Europe with more than 400 hectares of palm-tree groves - has a coastline of over 9 km of long beaches, most of which - despite having full facilities - are set in beautiful unspoilt settings. Furthest to the north lie two natural beaches with fine sand and clear waters, plus another, more popular, semiurban beach known as Arenals del Sol. The three beaches further south are more exotic and natural in appearance being delimited by an interesting strip of sand dunes belonging to the Elx-Guardamar sand dune system. These beaches are the perfect setting for water sports, with two diving centres that organise dives off Tabarca Isle and other spots along the Costa Blanca. Open virgin beach with fine golden sand offering clean and blue waters. 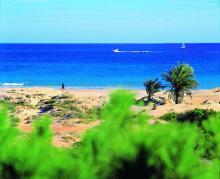 Its environment is marked by an important dune strip giving the beach an attractive natural image. Concern about environment shown at this fine sand natural beach allows it being considered a virgin beach. Very suitable place to enjoy bathing without crowds.